Elevate semi-trailers to loading docks for maximum serviceability during loading and unloading operations. Manufactured from heavy-duty aluminum tread plate for positive traction. 30,000 lb. uniform capacity per pair (sold each). Optional Portable Wheel Riser Caddy, Portability Kit, Welded Fork Pockets, Anchor Brackets or Extra Bolt-On Brackets & Hardware are also available – please see Options tab for details. 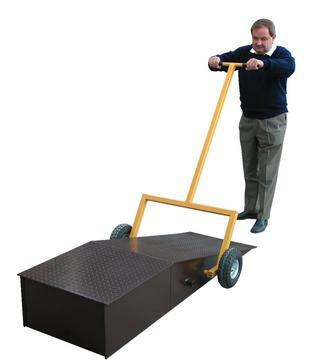 Allows one person to transport and place wheel risers. For use with Aluminum Wheel Risers only.